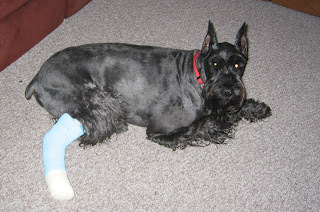 Well, we ended up taking Boogie the Giant Schnauzer to the Animal Hospital yesterday, as I felt a strange crunching sound when I palpated one of his toes. Yep, Boogie-Dog's got a broken toe. The good news is that it's his outside toe, so it's non-weight bearing. The bad news is that he's a large, active dog, and the splinting process doesn't always work on pups like him. He'll be splinted for the next 4-6 weeks, during which time he needs to stay off of it and avoid stairs. Right now he's drugged up on pain killers, so the "staying quiet" part is pretty easy. I suspect that long about week 3, things will not be as easy. The alternative is to have a pin inserted in the break or to amputate the toe. Poor Boogie. He'll never learn that chasing the rabbits never ends up with him getting the better end of the deal. Lots of extra petting and treats for you dear pup! You may have to sedate him for the entire 4-6 weeks. Yeah, he's gonna stay quiet all on his own. Poor baby! Are you going to have to carry him up and down the stairs, or is he just going to have to become a downstairs dawg? It's so sad and more heart-wrenching to see a pet in a cast or bandage. :( I wish him a speedy recovery. Do baby gates work to keep him contained, or does he just knock them over? As awful as a broken toe is, I'm glad it was that rather than something untreatable, like hip dysplasia (however the hell you spell that). I hope you're holding up well under your not so relaxing weekend. He's on the main floor at the moment, going potty in the front yard. Our home is on a hill, and the backyard is only accessible via stairs. For work-days, I'll help him negotiate the stairs to the basement when I begin working, and he'll stay downstairs with me all day. Then I'll help him up at the end of the work day, so he can be near the family in the evening. His vet said stairs once a day is probably going to be okay. As the day goes on, he's becoming more and more comfortable with the splint, so I think we'll be all right. So far, he's not chewing at the splint, which is what we were really concerned about. I checked with my brother (who is a vet). He says if you're having trouble regarding the dog chewing on his cast, rub a little bacon on it. I felt kind of bad after I saw your comment over on my blog: I was the one with the lark weekend in comparison, and I hope Boogie gets to feeling better soon. Rub his belly for me, and give him some bacon (not rubbed on his splint) if he's up for it. Hope he's feeling better--and back to romping after rabbits (he shouldn't learn not to if it means he's not having fun!)--soon. Poor Poor Boogie! I am so sorry but know the trouble you are going to have only to well. But sometimes giants do catch the rabbits. Ask our Roger. And he does it with a gimpy leg somehow. In fact, I can see that keeping him quiet for six weeks is definitely going to be the problem, judging by how he went down the basement stairs this morning. And Eric, no need to feel bad. These things happen - you just deal with them as best you can. Boogie! My sweet over-sized canine nephew! You have a boo-boo? I'm glad he's ok so far. Poor guy.